Some non-seed inputs can be used in organic agriculture to ensure and/or improve crop productivity. To be organic certified, growers need to stop applying prohibited inputs such as synthetic insecticides, fungicides, and herbicides and ammonia-derived nitrogen products to their farms for a period of three years. Once a grower is certified, they need to comply with the regulations described in the Organic Foods Production Act and must use products that meet the requirements of USDA's National Organic Program (NOP). Individual certifying agencies can also provide guidance on what inputs are and are not allowed. There is a wide range of available inoculants and soil amendments that can be applied to change soil properties and to improve plant growth. For example, compost can improve soil structure, thus increasing plant-available water-holding capacity and lowering bulk density. Compost amendment also can foster beneficial microorganisms. Green manures added to soil from cultivating cover crops between cash crops can be effective in adding or maintaining fertility, suppressing weeds, and/or hosting beneficial microorganisms. Specific microbial inoculants (e.g., mycorrhizae, nitrogen-fixing rhizobia, and weed-, pest-, and disease-suppressive biocontrol agents) also are available to improve soil nutrients for plants and to reduce disease pressure. In order to assist growers in understanding these various optional inputs, we provide descriptions of each type of input and a partial listing of commercially available products certified for use in organic agriculture by the Organic Materials Review Institute (OMRI). Many additional products currently on the market may be acceptable to individual certifiers. Organic growers in Ohio are encouraged to check with OEFFA's approved product list as they plan disease management strategies and prepare their organic management plan. The amount and type of fertilizer required for efficient organic farming are mainly dependent on soil fertility at the time of planting and the types of cash crops being grown. To maintain appropriate and balanced soil fertility, a soil test should be conducted before applying fertilizers. Also, different crops have slightly different nutrient requirements and remove different amounts of nutrients from the soil each year. For example, production of one ton of tomato fruits can remove 3.0–8.0 pounds of nitrogen and 0.5–3.0 pounds of phosphate from soil, whereas the same amount of potato production can remove 8.0–15.0 pounds of nitrogen and 1.6–7.0 pounds of phosphate. Therefore, before selecting the type and amount of fertilizer application, a grower should ask two questions: (1) how much and which nutrients are available in the soil?, and (2) how much added nutrients will the target crop require to yield well? A wide range of organically acceptable fertilizers may be used. Some of these fertilizers can deliver specific nutrients (e.g., borax for boron, Epsom salt for magnesium, and rock phosphate for phosphate). Others can provide multiple nutrients (e.g., bone meal mainly for phosphate and nitrogen; gypsum for calcium and sulfur; and seaweed meal, worm casting, and fish meal for nitrogen, phosphate, and potassium, along with various micronutrients). The organic fertilizer and cover crop calculator, developed by Oregon State University Extension (smallfarms.oregonstate.edu/calculator), can be used to estimate proper application levels based on plant-available nitrogen (PAN) estimation for 28 days or for a full season after the application. This calculator can aid one in deciding how much fertilizer to apply to achieve a desired nutrient level. The calculator also provides cost estimation; thus, it can be useful for comparing the cost and nutrient value of different organic fertilizers. Green manures can be added to soil by cultivating cover crops between cash crop growing seasons. For example, cover crops can be planted in the fall after harvesting the cash crops. The cover crops established in fall often can continue to grow in spring, and then plant materials can be plowed into soil or chopped and spread out on the soil surface before planting the next cash crop. Green manures provide a wide range of benefits to organic farming, but the range of benefits can be different dependent on the choice of cover crop. Grasses (e.g., rye, wheat, and sorghum) are easy to establish and form extensive root systems, thus reducing soil erosion and improving soil structure. Legumes (e.g., clover, vetch, and alfalfa) provide nitrogen. Other types of cover crops such as Brassica (mustards and radish) can effectively manage weeds and pests, particularly against nematodes. Furthermore, cover crops composed of mixed species of plants can provide a broader range of benefits. Combinations of grasses and legumes can bring the C:N ratio to a more optimal range for plant nutrient uptake, and the addition of allelopathic plant species to grass and legume combinations can add weed and pest control. It has also been reported that mixed hay-grown soils display elevated levels of plant disease suppression by fostering beneficial microorganisms that act, in part, as pathogen antagonists. Figure 1. A windrow composting facility at The Ohio State University/OARDC. Photo credit: Frederick Michel, OSU/OARDC. Composts provide fertility and many other benefits to soil that no other chemical fertilizers can provide. Composts contain both macro- and micro-nutrients in proportions not typically present in most fertilizer inputs. Nutrients in composts are released slowly, thus providing more balanced nutrition throughout the growing season while reducing leaching potential. Composts can also buffer soil acidity or alkalinity so as to develop a more optimal pH for plant growth. In addition to adding nutrients, the main benefit of using composts is the improvement of soil structure. Organic matter provided by compost amendments can promote soil aggregate formation, thus improving soil structure. Improved soil structure can lead to better water infiltration, air penetration, and plant-root establishment. The added organic matter also increases retention of soil nutrients and, if properly incorporated, reduces soil-erosion risk. Composts also foster diverse soil organisms; these bacteria, fungi, insects, and worms can further enhance nutrient mineralization and reduce plant pest and disease pressure in the soil. Compost teas are liquid solutions that are used to deliver fertility, bioactive dissolved organic carbon (e.g., fulvic acids), and microorganisms by drenching on soil or applications to foliage. Compost teas can be made simply by steeping compost in water (passive compost teas) or by applying additional nutrients and aeration for better growth microorganism (aerated compost teas). It should be noted that the latter approach may present some risk of culturing pathogens and should be approached with caution. Composting on-farm has many advantages; however, it requires close monitoring of the composting process and the final chemical composition of compost. On-farm composting can be a good solution for manure (produced on-farm) management and may reduce waste disposal costs. However, farm-scale composting can be challenging because depending on the scale of the farm, it may require the purchase of special equipment and may add to labor costs. Moreover, control of compost quality requires close monitoring. The NOP has strict regulations on composting as it applies to certified land applications. 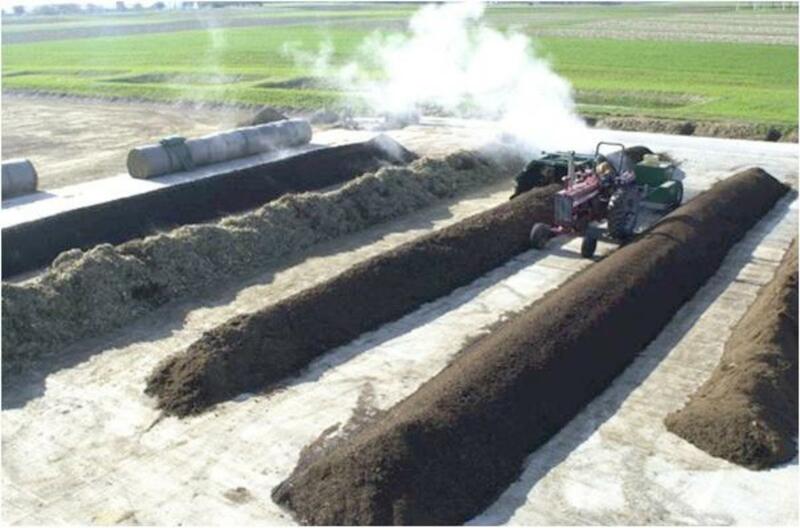 A qualified compost should have a C:N ratio of between 25:1 and 40:1 and a maintained temperature between 131°F and 170°F for 3 days using an in-vessel or static aerated pile system or for 15 days using a windrow composting system (Figure 1). Alternatively, organic-certified composts can be purchased commercially. Such options may provide a more consistent quality of compost, but currently only the relative NPK content can be assured. When choosing a compost product, be sure to check the chemical composition of the compost. Continuous application of compost containing a high quantity of salts and phosphorus may present problems of saline stress or nutrient imbalances in the soil and water in the long term. The term mycorrhizae means "fungus roots" in Greek and refers to a mutually beneficial association between mycorrhizal fungi and plant roots (Figure 2). Such symbioses have been found in nearly all families of crop plants (the primary exceptions being spinach and canola). Mycorrhizal fungi may colonize roots of the host plant internally (endomycorrhiza) or externally (ectomycorrhiza). As mycorrhizal fungi colonize plant roots, the volume of soil that plants can explore for nutrient uptake of phosphorus (especially) and some other mineral nutrients is expanded. Thus, mycorrhizae as members of the soil community help ameliorate plant stress associated with low soil levels of various mineral nutrients, and they can further improve plant growth and yield. Mycorrhizae also contribute to soil aggregate formation by providing aggregate formation nuclei and producing glomalin, a sugar-protein compound that works as a stabilizing coat on soil aggregates. And some strains have been found to be significant contributors to plant disease suppression, though the conditions under which such benefits are conferred are not entirely clear. Rhizobia are soil bacteria that form symbiotic relations with plants (mostly with legumes). They belong primarily to the genera Rhizobium, Azorhizobium, Bradyrhizobium, and Sinorhizobium. Rhizobia first invade plant roots and form nodules in which they convert atmospheric nitrogen into plant-accessible forms of nitrogen (Figure 3). There are also some Actinomycetes strains that form nodule-like structures on non-leguminous woody shrubs or trees such as Alnus (alder) and Malus (apple). Responses to inoculation are greatest on land during the initial plantings of a particular legume species (different inoculants are required for different crops). However, enhanced yield responses have been seen with regular inoculation as well. 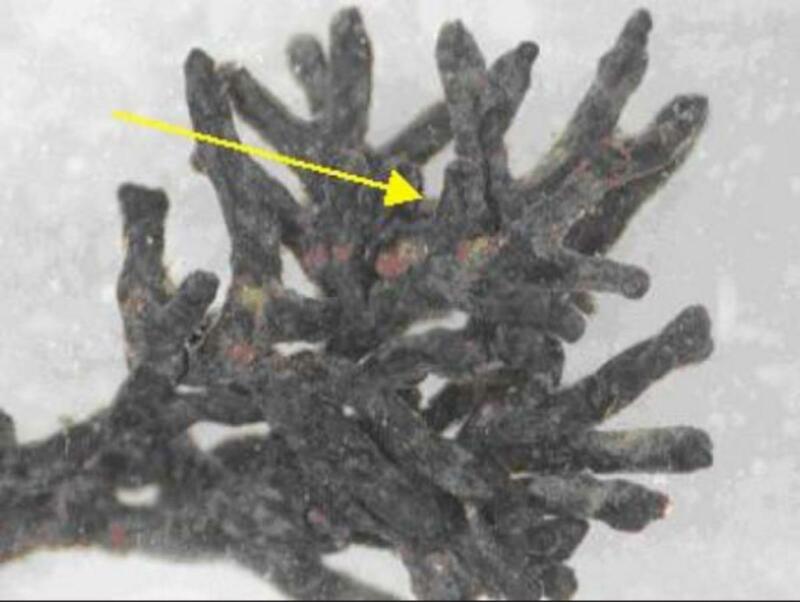 In contrast, associative nitrogen fixers (Azospiril ium, Azobacter, and Acetobacter) colonize close to the roots but do not form nodules. Also included are blue-green algae, which are also bacteria that fix nitrogen. Rhizobia and associative nitrogen fixers can provide substantial nitrogen to plants and soil without additional nitrogen fertilizer input. 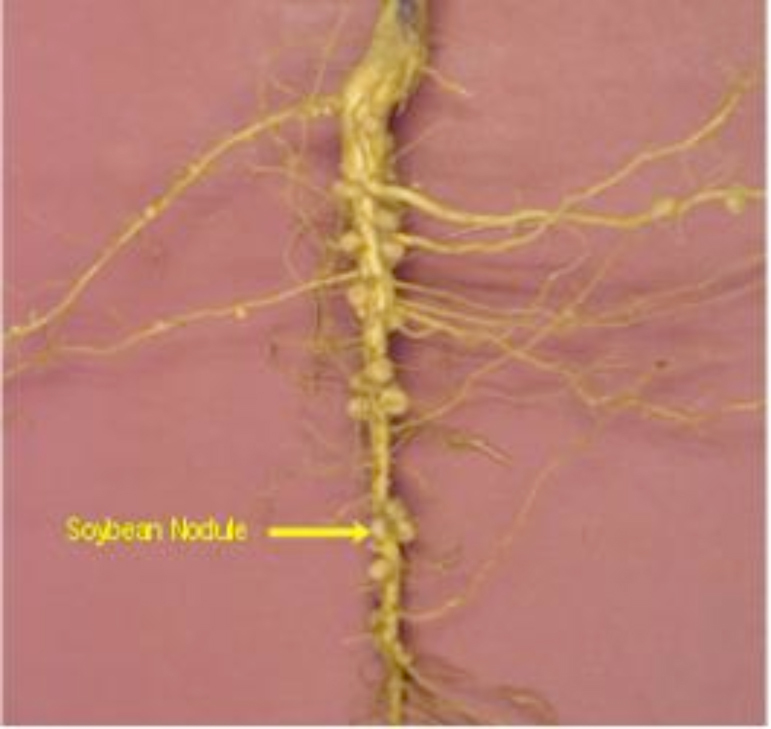 Nodule-forming symbiotic nitrogen fixers can provide 45–360 lbN/A/yr on legumes and 18–270 lbN/A/yr on non-legumes. Nitrogen input from associative nitrogen fixers can range from 9–180 lbN/A/yr depending on soil composition. The actual quantity of nitrogen provided by such symbioses is influenced by endogenous soil microorganisms, plant genotype and age, the occurrence of pest or disease damage, changes in physical and chemical soil conditions, and agricultural practices that affect root structure. Figure 2. An example of a highly branched ectomycorrhizae root tip. Photo credit: Nathan M. Kleczewski, OSU. Figure 3. Rhizobial nodules on soybean roots. Photo credit: Horst Bohner. Biopesticides are products with a noted capacity to suppress pests or diseases. Both types of products may have microbial or biochemical origin. Microbial biopesticides include living beneficial bacteria, fungi, or nematodes whose activities directly or indirectly reduce disease or pest damage. The advantages of microbial biopesticides include their ability to reproduce to some degree following application, thereby allowing for a natural "bloom" of suppressive activities. Biochemical biopesticides may contain plant extracts, microbial fermentation products, phage, or other natural materials that do not grow and reproduce following application. The advantage of these materials is that rates of application and net responses can be more precisely controlled and predicted. In contrast, biofertilizers (sometimes referred to as plant "strengtheners") are products with noted capacities to improve plant growth and/or productivity but for which no specific claims regarding pesticidal activities are made. These products may have some capacities for pest or disease suppression, but their primary mode of action is thought to be related to their ability to directly enhance host nutrient status. Some products also contain phytohormones that may directly affect plant growth. Many such products are mixtures for which no single mode of action can be pinpointed as the basis for beneficial affects, and it should be noted that product quality is more likely to be variable for biofertilizers than for registered biopesticides where quality control is regulated. Figure 4. The OMRI-listed label for OMRI-approved products. The Organic Materials Review Institute (OMRI) is a non-profit organization established to provide the service of organic product review. Both the active and non-active (inert) ingredients of the products are reviewed for compliance with the specification of the NOP. Once a product is submitted for OMRI organic certifications, the product goes through OMRI staff review, then to the OMRI review panel. When the review panel approves the product, the product becomes OMRI-listed. The approved product can then have an OMRI-listed label (Figure 4) and will be listed on the OMRI products list. Because it is the NOP that specifies what practices and inputs may be used prior to subsequent marketing of a crop as organic, most certifying agencies will allow for independent assessment of input suitability using the NOP guidelines as the benchmark. This is particularly relevant to cover crops (also referred to as "green manures") which do not fall under OMRI review, but most certifiers and organic farmers will accept the OMRI-approved materials without further review as long as they are applied at rates allowed under the NOP. Examples of the different types of OMRI-approved inoculants and soil amendments are listed in Table 1. Trade name, manufacturer, and main active components are listed based on the OMRI product categories. Note: These data are provided for informational purposes only; the listings in no way signify endorsement of any particular products or manufacturers by The Ohio State University. Table 1. Some examples of the many OMRI-Approved Inoculants and Soil Amendments That Can Be Used in Certified Organic Farming. Fertilizer and soil amendments Down to Earth Bone Meal 3-15-0 Animal by-product and materials Down to Earth Distributors, Inc.
Biomin® Boron 2-0-0 Boron products JH Biotech, Inc. Converted Organics™ NC 0.4-1-0 Chitin Converted Organics, Inc.
DoloPril Dolomite Pacific Calcium, Inc.
Ultra Fine™ A-G Gypsum Western Mining and Minerals, Inc.
Nurturing Nature Worm Castings Worm castings Nurturing Nature Organics, Inc.
BioBalance Compost tea The Compost Tea Company, Inc.
Commercial Compost Compost Cranford, Inc.
Sonoma Organic HI-TEST Compost Compost Sonoma Compost Co.
Griffin Feather Meal 12-0-0 Feather meal Griffin Industries, Inc. Perfectly Natural™ Tomato and Vegetable Fertilizer 5-6-6 Blended fertilizers Perfectly Natural Solutions, Inc.
Pest and disease control Biobit® HP Bacillus thuringiensis, Insecticides Valent BioSciences® Corp.
Mycotrol O® Beauveria spp., insecticides Laverlam International Corp.
BioNem C Beneficial nematodes, biological control Becker Underwood®, Inc.
Serenade® MAX™ Microbial products, Bacillus subtilis, fungicide AgraQuest, Inc.
Blight Ban® A506 Pseudomonas fluorescens NuFarm Americas, Inc.
MycoApply® Ecto Liquid Blend Microbial products, ectomycorrhize Mycorrhizal Applications, Inc.
Nodulator® Liquid Inoculant for pea and lentil Inoculants, rhizobia Becker Underwood®, Inc.
Vault® NP Liquid Legume inoculant for soybeans Inoculants, rhizobia Becker Underwood®, Inc.
Cao, C., S-J. Park, and B.B. McSpadden Gardener. 2010. Biopesticide Controls of Plant Diseases: Resources and Products for Organic Farmers in Ohio. (Fact sheet). Columbus, OH: The Ohio State University. Ohioline. Hoitink, H., and H. Keener, eds. 1993. Science and Engineering of Composting: Design, Environmental, Microbiological and Utilization Aspects. Worthington, OH: The Ohio State University with Renaissance Publications. Ohio Ecological Food and Farm Association (OEFFA). A list of OEFFA-approved organic products can be obtained by writing to materialsreview@oeffa.org (oeffa.org). Oregon State University Extension, Organic Fertilizer and Cover Crop Calculator. (smallfarms.oregonstate.edu/calculator). Organic Material Review Institute (OMRI). This web contains a brand name list of products reviewed and listed for organic production (omri.org). Pal, K.K., and B.B. McSpadden Gardener. 2006. "Biological Control of Plant Pathogens." The Plant Health Instructor DOI: 10.1094/PHI-A-2006-1117-02. Ryan, M. 2003. Compost Tea Production, Application, and Benefits. Kutztown, PA: The Rodale Institute. United States Department of Agriculture (USDA)/National Organic Program. This web site includes the regulations and policy statements regarding the National Organic Program (www.ams.usda.gov/about-ams/programs-offices/national-organic-program). Watson, M.E. 2003. Testing Compost. ANR-15-03 (Fact sheet). Columbus, OH: The Ohio State University, Agriculture and Natural Resources. Willon, A. 2005. The World of Nitrogen Fixation Series: Part 1—Types of Nitrogen Fixation. (www.bfa.com.au/_files/AOJ%20iss61_p23.pdf)(no longer available online). Funding to support the development of these materials was provided by the USDA's Organic Agriculture Research and Extension Initiative Grant, 2009-51300-05512.